India's 1st Organic Bamboo Based Wipes. The basis requirement of a every mom is diapers along with wipes, whether it is at home or at outings. These two products go hand in hand. I am always in search of herbal/Organic products which do not contain chemicals especially where kids are concerned. Most of the wipes have chemicals or are made of polyester. This can be harsh and harmful on the delicate skin of kids. But when I started using the Mama earth wipes my search ended. The mama earth wipes have lovely refreshing smell which I love very much. They are made up of organic bamboo cloth due to which they are very soft. They are of high quality as each wipe is wet and soaked which gives effective cleaning. They keep the skin fresh and moisturized. Everyone in my family not only kids but adults have started using these wipes for cleanliness, freshness and moisturizing skin. Almond Oil, Shea butter, Lavender Essential Oil, D-gluconic Acus Lactone, Disodium Cocoamphoacetate, Glycerin, Deck Glucoside, Aloe Vera Extract, D-Panthenol, water, Potassium Sorbate. Open the lid and remove the wipes as required. Close the lid and back prevent moisture loss. Mama earth wipes are for INR 249/- and are available on the shopping portals online. 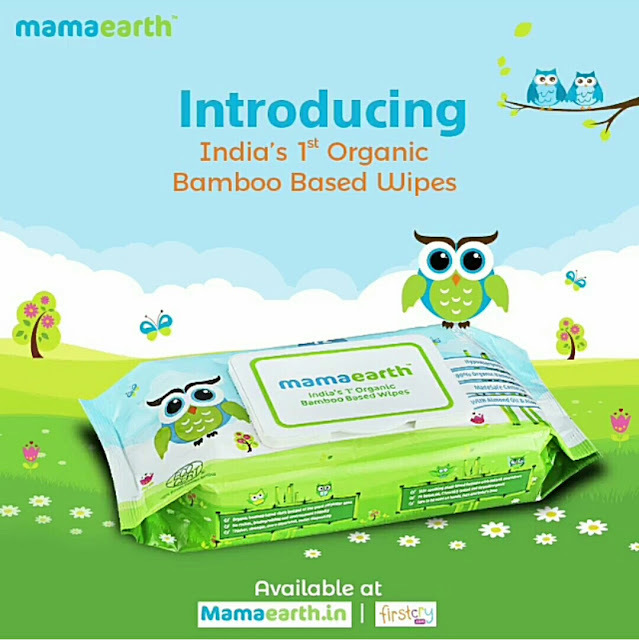 Mama earth wipes are made up of 100% Organic Bamboo Cloth. Mama earth wipes are ecofriendly and biodegradable. Mama earth wipes come in a travel friendly packaging. Mama earth wipes are soft and hydrated. Mama earth wipes are chemical and polyester free. I had the opportunity to try these out and it has blown me away. Being someone who strongly believes in organic and environmental friendly products I have high appreciation for the brand to bring out there organic bamboo wipes! I wonder if these are available in Canada too?